Ham comes in many varieties, including precooked, cured ham and uncooked roasts. How you prepare the ham depends largely on the type you choose. Fresh ham comes from the the hind leg of a pig. Typically when you buy a fresh, raw ham, it is uncured and uncooked. Canned and spiral cut hams, on the other hand, are typically precooked and only require heating through. If you have a fully cooked ham, all you need to do is heat it to serving temperature. Remove the ham from its packaging and place in a racked roasting pan. Cook to an internal temperature of 145 degrees. The length of time will vary depending on the weight of the ham, but plan on about 12 to 14 minutes per pound. Use your favorite ham glaze recipe to add the final touch, and serve hot. 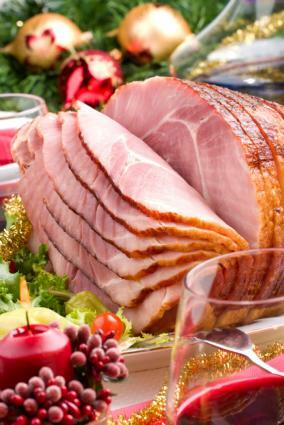 Fresh hams can be as small as 10 pounds or as large as 45 pounds, but for the average-sized holiday party, a 15 pound ham will be more than enough to feed everybody with about a pound of ham per person. You probably won't be serving a full pound of ham to each guest, but the bone, if you have a bone in ham, will be some of the weight. Although most fresh hams available in the store have cooking ham instructions on the package, these basic instructions are a good place to start. Do not remove any fat or rind that is on the ham. Place the ham on a rack in a roasting pan. Bake for 18 minutes per pound. Test the temperature; it should be cooked to 160 degrees. Let cool for 10-15 minutes. Remove the rind and fat. Slice and serve. Country style hams have been dry-cured. These hams need to be soaked before cooking. The instructions for these types of hams often require the cook to soak the ham for several hours or even overnight. Place the ham in a large pot and cover with cold water. Place the ham in your refrigerator and let soak for 24-36 hours, changing the water occasionally. Two water changes should be enough. Remove the ham from the water and scrub it thoroughly with a stiff brush. A wire brush works well here. Be sure to scrub off any mold that is on the ham. The mold is a natural occurrence and is not a sign that the ham is bad; however, the mold is not good to eat. Place the ham in a large pot. Fill the pot with water. Simmer the ham for 20 minutes per pound. For a 10-pound ham, that is about 3 hours. After the ham has simmered for 2 hours and 15 minutes, add the apple cider and ¼ cup of brown sugar to the water. Let the ham simmer for 45 minutes more and remove the ham from the pot. Remove the skin from the ham. Leave a thin layer of fat on the ham, about ¼ to ½-inch thick. Sprinkle the ham with ¼ cup of brown sugar, 1 teaspoon of ground pepper, and ¼ teaspoon of ground cloves. Place the ham on a rack in a roasting pan and bake for 15 minutes or until the glaze is set and the ham has an internal temperature of 160 degrees. No matter what kind of ham you enjoy, you're sure to make them taste their best by following these basic cooking instructions. Low Calorie Whole Wheat Bread Recipe By Erin Coleman, R.D., L.D. How Long Do You Grill Hamburgers? By Erin Coleman, R.D., L.D.